A true PCI compliant and Secure Mobile Phone Credit Card Processing solution to accept payments at more places! FAST & SAFE : Wherever customers are, that is where the transaction needs to occur. Process transactions virtually anywhere, anytime by turning your smart mobile phone or device (e.g. 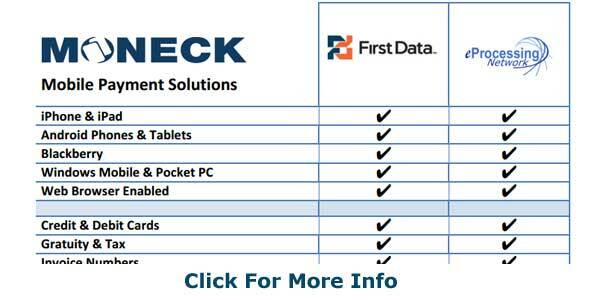 iPhone, iPad, Android, & Tablet PC) into a point of sale device. The entire process is simple and convenient to use. Physically key in sales transactions or swipe them using our (optional) card reader. We provide Live professional support every step of the way. A complete mobile billing solution that can process invoice numbers, gratuity, tax, credit card, debit card, cash, check, gift cards, and inventory transactions. All mobile phone payment solutions can seamlessly integrate into a virtual terminal for enhanced processing and reporting features and (optional) QuickBooks compatibility. Real time processing allows you to get approval or decline responses at the time of sale. No payment data is stored in the phone thus reducing security risks for both your customer and business. Lower investment, use your existing smart phone, versus purchasing dedicated wireless transaction processing units. Reduce rates with Card swipe transactions rates. No chasing after customers for declined transactions or writing customer info down on paper. Swipe or Key in transactions directly into your wireless device. Online tracking and transaction reports. Print or Email customer receipts. Regardless of whether you are a small or a high volume business, we have the perfect mobile/smart phone payment processing solution to help you accept all types of credit cards, debit cards, gift cards, and checks.